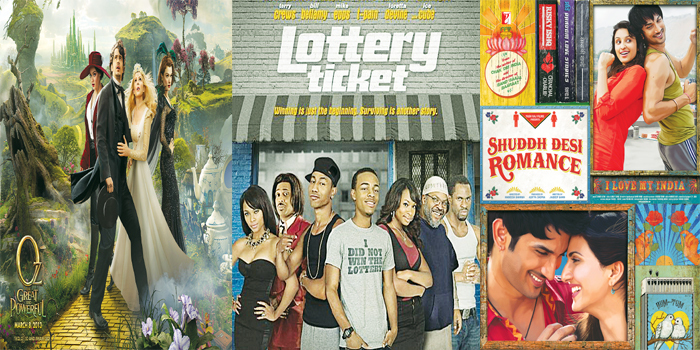 Posters of (from left to right), 'Oz the great and powerful', 'Lottery Ticket' and 'Shuddh Desi Romance'. Small-town boy Raghu Ram (Sushant Singh) is commitment phobic. On the day of the wedding he runs away. On the bus, he meets free-spirited Gayathri (Parineeti Chopra), falls for her and gets into a live-in relationship. However, on the day of their wedding, Gayathri runs away leaving Raghu heartbroken. Later, he gets serious about Tara, his ex fiancA� and starts seeing her. But things get complicated when Gayathri comes back into his life. The film was screened in the Gala Presentation section of the 2013 Toronto International film festival. Kevin Carson (Shad Gregory Moss), lives in the Fillmore Projects with his best friend Benny (Brandon T Jackson). On his way to work, he gets into a scramble with the local bully, Lorenzo, and loses his job. To cheer him up Stacie buys him a fortune cookie, in which he finds playing numbers. He puts the numbers onto a lottery ticket worth $370 million. Unfortunately he has to wait for three days to cash the lottery. Kevin decides to keep the news a secret. That doesna��t work as Lorenzo and the bullies come to know about it and are now after the ticket. Rapper Nicki Minaj auditioned for one of the roles in the film. A small-time magician in a travelling circus, Oscar (James Franco) is caught for flirting with his bossa��s wife. As a storm approaches, Oscar jumps into an air balloon that is sucked into a tornado and magically reaches the Land of Oz. Believing that he is the man destined to kill the wicked witch of Land of Oz, Witch Theodra falls in love with him. Along with a troop, Oz heads into the forest to destroy the wicked Witcha��s wand, which is her source of power. But on encountering her, Oz realises the real wicked witch has been with him, in his troop. Robert Downey Jr and Johnny Depp were both offered the role of Oz. Downey wasna��t interested; Depp liked the role but was already committed to The Lone Ranger.